US Air ForceThe US Air Force’s F-22 Raptor. US F-22 Raptor stealth fighter jets just completed their first “combat surge” in operations over Syria, and in doing so deterred almost 600 enemy aircraft. The F-22s protected US forces when the US struck Syria in April over chemical weapons use by flying deep into enemy territory populated with sophisticated air defences. 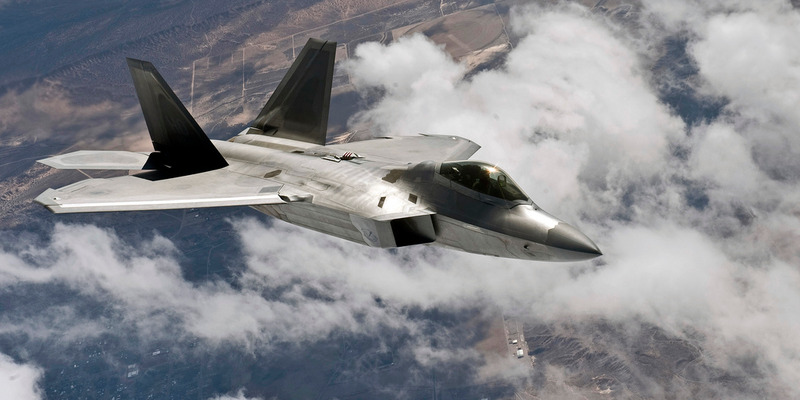 US F-22 Raptor stealth fighter jets just completed their first “combat surge” in operations over Syria, and in doing so deterred almost 600 enemy aircraft in the crowded skies there that see Syria, Iranian, and Russian combat aircraft on a regular basis,the Pentagon said. The Pentagon said the F-22 “deterred” 587 enemy aircraft in the process, suggesting the jet commands some respect against older, Russian-made models often in operation by Russian and Syrian forces. This surge saw F-22 operations maximized over a three-day period. F-22s on this deployment escorted US Navy F/A-18s as part of their mission. In June 2017, Lt. Cmdr. Mike “MOB” Tremel, an Navy F/A-18E Super Hornet pilot, scored the US’s first air-to-air kill in years after downing a Syrian Su-22 that threatened US forces in the country. The stealth fighter pilots defended US forces against enemy bomber aircraft and also backed up US, UK, and French forces when they struck Syrian President Bashar Assad’s regime in the country’s west in response to chemical weapons attacks. The F-22s flew “deep into Syrian territory, facing both enemy fighters and surface-to-air missile systems,” the Pentagon said. While no US or allied aircraft went down, photos from the most recent US attack on Syria’s government show the country’s air defences firing blindly into the night sky as the F-22s worked overhead.